Thanks, @je2a3! I think the extended range of the biflex is indeed more of a spike and the valley before it is why it lacks color on it’s own. I’ll be on the hunt for some 414’s, should be fun to compare and I think not having to eq out the spike will be beneficial. Please report your findings if you get to compare the 419As vs 414s. The memorable WE753 experience I had was a 2-way version with a WE713A (aluminum diaphragm) compression driver. I had a chance to listen to another WE753 that supposedly had a phenolic diaphragm'ed compression driver but it wasn't a WE713B. The driver had a shorter (smaller) magnet, maybe a WE720A(?) and a Jensen RP302 super tweeter. I think this unit was botched up and should have had a WE713B + a WE752 super tweeter. This unit was not as impressive. Thanks for your recollections @je2a3. I first listened to the 32 metal horn with my 9 metal element diaphragms in my Coral M100 drivers (almost the same as at the 2410 and 2420 JBL drivers). From memory they seemed to have more speed and clarity and a little more air to the phenolics. But when i put the phenolics in i quickly forgot / lost interest in what the metal diaphragms did. The phenolic has enough of these things to still be wonderful in these areas but also added deep tone and timbre and a coherence to the Atec 414 16b I'm using. Violins guitar string tone is wonderful on my reel to reel copies of master tapes and even trumpets/ saxophones just sound real. They don't seem to have that slight metallic hash/overtone and sizzle that metal diaphragms seem to have. The next thing i want to try is the bakelite back plates that cover the diaphragms in place of the larger rear cap. Most people report that this was done to limit excursion on drivers and that it sounds worse but the 713 drivers had a similar cover back plate so i would like to try it and see what it does. Could you describe the sound of the 753 speakers (the memorable experience you had) How did the sound differ from what you have experienced with your 414 / 32/ 802 experiences? Where there large similarities or differences? Thank you. I don't think it is realistic to make a direct comparison to my present 414/614/802/32 system because I heard that WE753 almost 20 years ago. It was memorable because it was tonally similar to my main speakers then (OB/Altec 755A) but more extended at both frequency extremes and a lot more dynamic. I've lived happily with my present set up for at least 8 years. But whether it measures up to that WE753 system can only be settled if I could compare them side by side. Check out these on ebay. It says new but not sure if they're new manufactured or NOS. I just got an email that my 808-8B’s are on their way back to me from Bill at GPA as 802-8G’s. One step closer... time to start getting together crossover parts. Time to start putting together a shopping list for crossover parts, binding posts, dampening material, veneer, etc. Starting with the crossover, what considerations need to be given, based on the fact that I have 16 ohm woofers and 8 ohm CD’s. I see that @je2a3 has shared a 16 ohm and an 8 ohm versión of the crossover. Do I choose the one which matches the impedance of the CD or do I need to marry the two somehow? Probably a stupid question, but I’ve never spent much time learning the intricacies of crossover design. 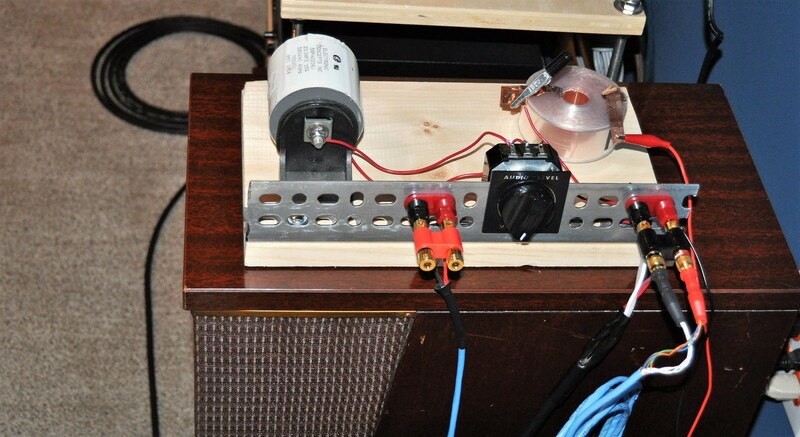 Since I have multiple 8 ohm and 16 ohm CDs, I plan on following the advice given by @J-ROB and use one of the Autoformers offered by @dave slagle as the level control on the horn. Sould provide a constant load to the crossover so I can use either 8 ohm or 16 ohn CDs without having to swap out parts on the high-pass filter. You can figure your values for each driver. Decide where you want the crossover points. What order crossover. For instance 2nd vs 3rd. Butterworth 2nd order was my choice. Once you have those numbers you can plug them into a simple crossover calculator and the cap values and inductors are spit out. I have 16 ohm CD and two 16 ohm LFs in parallel equalling 8 ohms. When I get around to it, I plan on using my 414Z full range (nothing between speakers and amp) with support on top with 32C/902 through single cap/L-pad per J-Rob. Bottom support with dual subs. 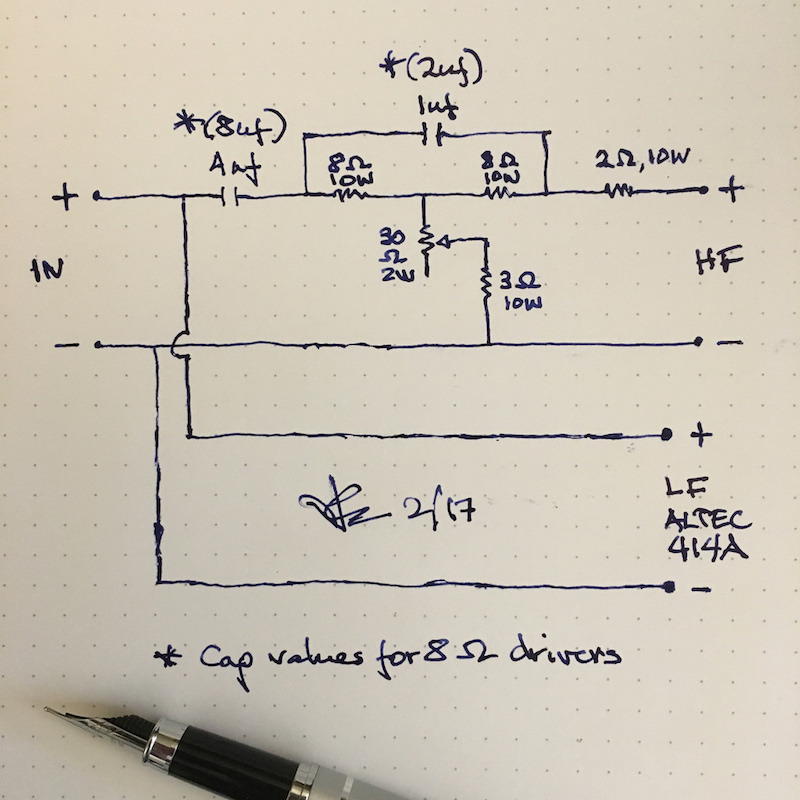 Run your 414s full-range, use the cap values for the 8 ohm compression driver. I tried the above crossover with less than stellar sound. It was easily bested by the N800-F clone but of course my set-up is different than Je2A3's. Jeff Mathers had good results with that set-up on two of his systems so be willing to try different things is my take home message. Thank you @je2a3, that’s exactly what I needed! My recommendation is you build them outboard so experimentation is a breeze. Looks cool and the chicks dig it! Just keep on thinking that Wntrmute2! She don’t love me, she just loves my network style. Does said “chick” have a sister?